This type of solar system is by far the most simply. Often there are only two main components in the system. 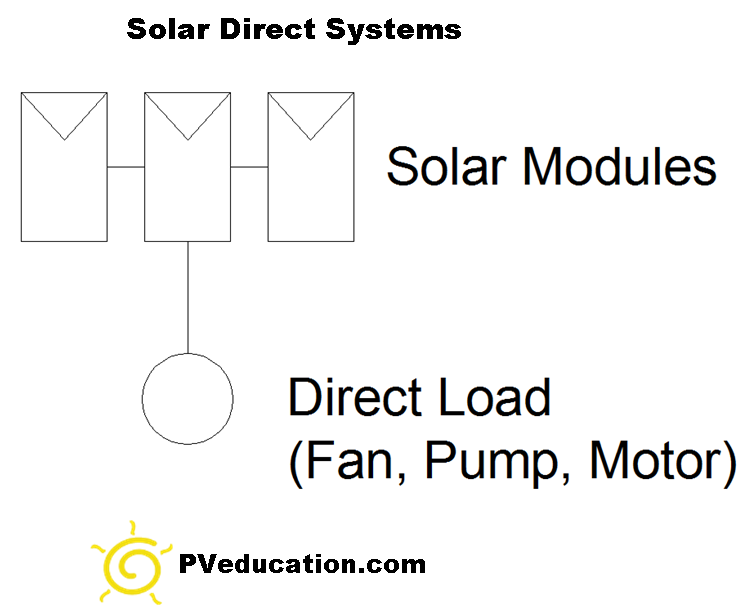 The solar modules are connected directly to a load which is often a motor. When ever the sun is up and shining the motor will work. Unlike electronics a motor can take a variable voltage and current input without being damaged. A solar powered attic fan is a great example of this system type. Another good example is a water pump. With a water pumping system, instead of storing energy water is stored. For example, if a rancher is pumping water for cows, the water is stored in a tank and that tank is used when needed to fill troughs for the animals. With most modern water pumping systems there is another component typically in the system between the solar array and the pump that controls the output of the solar array to better optimize the pumps operation. *Please keep in mind that for clarity I didn’t include any disconnects or over current protection in this system description. These items are typically required in ever system for safety.